Brown lentils are my new best friends. Cooked properly, they provide a dish with a satisfying ‘bite’, different from the mushiness of red lentils and the softer texture of the green lentils. 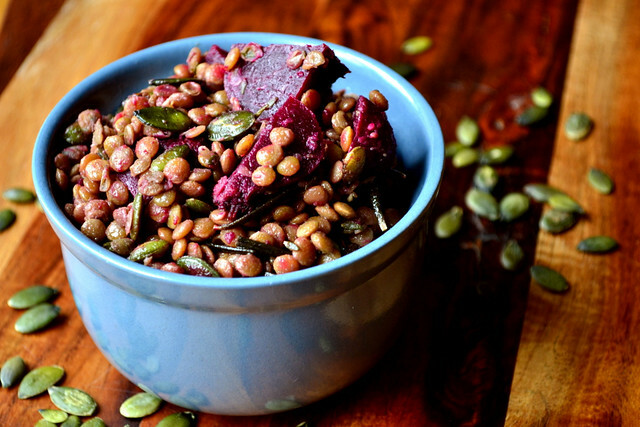 Brown lentils, therefore, are the ideal candidate for sides served cold, like this Brown Lentil and Beetroot Salad. At face value, this recipe seems like it’s been cobbled together using odd and ends from around the pantry. Then you eagerly pop a spoonful into your mouth and realise that the lentils and beetroot, both earthy in quality, go rather well together. Combined with the satisfying crunch and nutty quality of toasted pumpkin seeds, this brown lentil and beetroot salad is somewhat more moreish than you at first gave it credit for. Sneaky. One important direction to note is not over-toasting the pumpkin seeds. Pumpkin seeds “pop”, rather like popcorn kernels, though not as spectacularly. Since it’s best that they retain their original texture, brown them gently and remove from the heat just as they begin to snap. Tip the lentils into a large saucepan and cover with half of the prepared stock. Add the bay leaves and herbs. Cover and bring to the boil. The lentils will quickly soak up the stock. Keep adding more until the lentils are just cooked through. The pan should be relatively dry. Remove the herbs and bay leaves and set aside to cool. Once cool add the beetroot and olive oil. In a separate pan gently toast the pumpkin seeds and add to the salad. Season with pepper, mix everything together thoroughly and serve. Cost: Lentils. Beetroot. Stock. Sounds like a recipe for frugality to me. And it is. 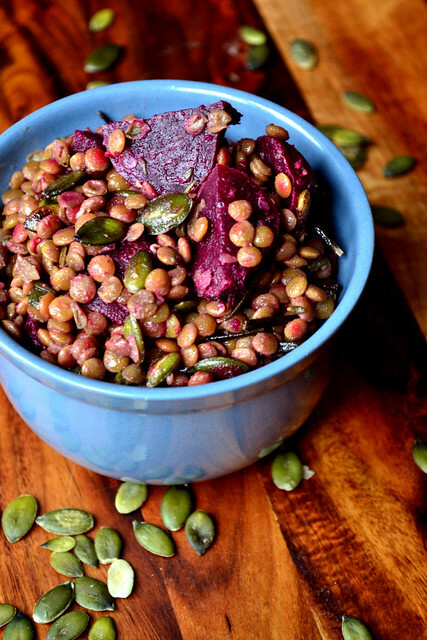 The entire Brown Lentil and Beetroot Salad can be made for under £1.50. I recently ate something similar to this, using puy lentils and raisins, at a cafe in town. I spent the entirety of last year being critically ill and mostly not knowing it (until I ended up almost dead in hospital; that was fun…) and I’ve bought a picnic basket set in the hopes of making up for that this summer. This is totally going to be in that basket! I’m sorry to hear that; I hope you’re fully recovered! Do try my salad, it’s delicious and very simple. All these ingredients absolutely pair beautifully with each other. I’ve become somewhat of a lentil fanatic as of late so this lovely recipe will be making it’s way onto my dinner menu. What a tasty and healthful meal! Well done Nick! Thank you, Karista. I’m a total pulse fanatic. As many as possible! So vibrant looking! Plus I’m a sucker for pumpkin seeds. Oh me too – they have a very impressive flavour. Thanks for the like on our page. 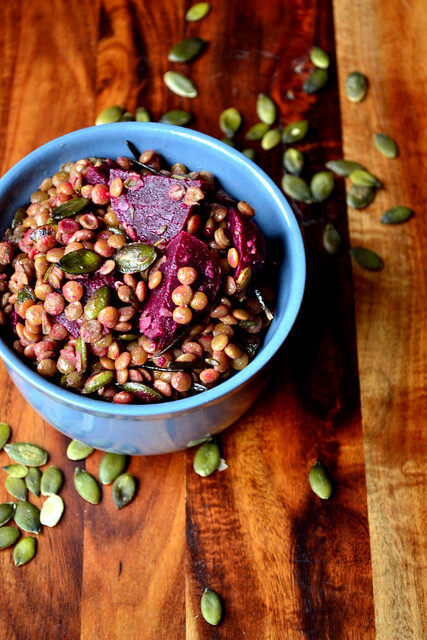 As for this…well…lentils & beets in the same damn place is stellar in my book. No worries! Yes, mine too – always delicious. 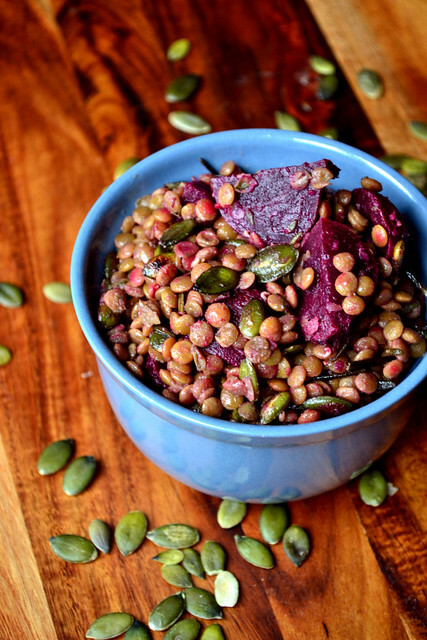 I really like lentils and pumpkin seeds so this is a great lunch idea. Filling and healthy. Thank you – me too. I’m a bit of a lentil addict. Hello, this looks lovely. Would it work with fresh beetroot? My dad grows some in the garden. I’d love to use it.